1. Keep your punctuation inside the quotation marks. Whenever quotation marks are used, make sure to keep any punctuation (commas, questions marks, exclamation marks) inside the quote. “What’s going on”? Sally asked. “What’s going on?” Sally asked. 2. Make sure you have a new paragraph for every new speaker. As long as there is more than one character speaking, each character needs his or her own paragraph, no matter how long or short the dialogue is. “Who’s there?” Sally asked. “It’s me,” Charlie said. Notice that the last sentence has no attribution (speaker identified), but we know Sally is speaking. How do we know? The writer started a new paragraph immediately after the character to whom she was talking. 3. Use commas to separate character names from their descriptors. When introducing a new character, authors often like to give them a small description to separate them from the rest of the cast. If the description is not essential to the meaning of the sentence, you need to set it off with commas. Sally was angry with Charlie her annoying younger brother for scaring her. Sally was angry with Charlie, her annoying younger brother, for scaring her. 4. Watch out for tense changes mid-sentence. Present tense (I am) occurs in the here and now, past tense (I was) explains things that have already happened, and future tense (I will) refers to something that is going to happen. Unless it is a conscious stylistic choice, the narrative of the novel should always remain consistently in one tense. Sally chased Charlie through the house but can’t catch him. Sally chased Charlie through the house but couldn’t catch him. 5. Use contractions to make dialogue sound more believable. Contractions occur when two words are combined to make speech flow smoother (ex: do not becomes don’t). Any lack of contractions should be purposeful character quirks or your character will come off sounding stuffy and stilted. Mostly likely, if a character isn’t using contractions, they’re a historical figure. “I am sorry for scaring you,” Charlie said and offered his toy dinosaur as reparation. “I’m sorry for scaring you,” Charlie said and offered his toy dinosaur as reparation. 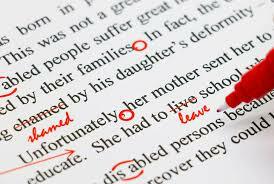 With these tips in mind, you will make sure readers lose themselves in your storytelling, not your grammatical mistakes. To learn more about editing or to receive quote from editing professionals, contact our editors at editor@e-allwrite.com. Thank you for this article about common grammatical mistakes. I often make these mistakes; sometimes in the name of artistic freedom and sometimes by shear carelessness. I will try to keep them in mind in the future in the pursuit of literary excellence.